I have a begrudging respect for John Hagee. It is quite an accomplishment to convince so many Jews, Jewish organizations and Israeli heads of state that you want to help them when in truth, you are trying to destroy their religion to fullfill yours. My exposure of him to fellow Jews has often been met with derision and anger. “How can you say anything bad about him?” they ask me. “Don’t you know how much money he gives to Israel and that he doesn’t convert Jews?” I once had a member of my synagogue call me an idiot and a fool after I gave a talk about Hagee. I have no idea what Hagee is thinking but I do know that he talks differently to his church members than he does to Jews. In a You Tube video of one of Hagee’s sermons, he talks about the 144,000 converted Jews that will fight the anti-Christ on earth after all true Christians have gone to heaven. Does he think these Jews are all going to stand up and volunteer to accept Jesus? Oh wait, he does. He thinks that will happen as soon as we see Jesus but those 144,000 need to be in place for the rapture to occur and Jesus to return to earth. So confusing! Nowhere on Cornerstone Church’s website or any website of Hagee’s that I have found, does it say that Jews are excluded from conversion. Rather they say that his members should spread the word of the gospel to all the world. Last time I looked, that included Jews. Check out the video: http://www.youtube.com/watch?v=63nbTTg4EcU In referring to the book of revelation: “It presents the Christ as triumphant, it presents the church as victorious.” He refers to a debt of gratitude to the Jewish people and then referring to G-d’s covenant with Abraham he calls the stars of the sky, the church (Oops, where did the rest of us go?) and the sands, Israel. Yet he expects Israel to be the seat of the new order where only those who have accepted Jesus will survive after the milennium. No practicing Jews in Israel, only converts to Christianity? Is this what Jewish supporters of Hagee believe? I doubt they even know he espouses that theory as they’re too blinded by the money he raises. There are other things about Hagee that are very insidious. He trains his followers to effectively use political influence to turn this into a country run by Christians that follow right wing tenets. Simply put, if he and others like him are successfull, America would become a fanatical Christian country. Bye bye, Bill of Rights! Here are some quotes from his church’s website.The bold emphasis is mine. We believe in the deity of Jesus Christ as the only begotten Son of God. We believe in His substitutionary death for all men, His resurrection, and His eventual return to judge the world. We believe all men are born with a sinful nature and that the work of the Cross was to redeem man from the power of sin. We believe that this salvation is available to all who will receive it. We believe in the Church as the eternal and universal Body of Christ consisting of all those who have accepted the work of the atonement. We believe in the need for a local assembly of believers for the purpose of evangelism and edification. The only reference to Jews is in a reference to Israel. Genesis, 12:3 says that those who bless Israel will be blessed and those that curse it will be cursed. Do you see anything in there about not trying to convert Jews. We may have an agreement with G-d but I don’t think that Hagee believes it includes salvation without accepting Jesus. One last thing. I don’t believe anything Hagee or any other preacher says about the rapture and what follows but Hagee and his followers do. Using his influence, he will try to bring on armaggedon by pushing Israel into war with Iran to fulfill what he sees as prophesy. As his influence in Israel grows so does the danger. I can only hope that the politicians have enough sense to separate the moneymaker from the fanatic. In a future blog I will go into depth as to how the money these evangelical preachers raise, is used in Israel. Many of you will be surprised and shocked by what is happening in Israel, America and all around the world. My research continues. Why Do They Try To Look Like Us? What does a Jew look like? Pretty much like everyone else, I would say. We come in all shapes and sizes, all skin tones, all eye colors and hair that ranges from stick straight to tight curls. With so many media venues using Yiddish expressions, anyone can sound Jewish. What then makes us instantly recognizable as Jews to both our fellow Jews and to others? It is the rituals of our religion and the paraphernalia that goes with it. A man wearing a yarmulke (kippah) is instantly recognizable as a Jew. A young woman wearing a Star of David, she’s bound to be Jewish. The Torah, the Aaron Kodesh where we keep the Torah, the tallis, modest dress of the orthodox, synagogues with Hebrew names, prayer books in Hebrew and English and our Shabbat services. All these are distinctly Jewish; or are they? This is a picture of Hope Of Israel, a messianic “Jewish” congregation not far from my home. Looks like a shul (synagogue) doesn’t it? If you were driving by isn’t that what you’d think? If you dropped by on a Shabbos morning, you would see something similar to a real Jewish service. 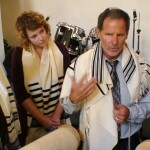 Here are pictures of “Rabbi” Barney Kasdan of Kehilat Ariel, messianic congregation in San Diego. and some members of his congregation. They look Jewish; wearing Tallesim, standing in front of what looks like an Aaron Kodesh and reading from what looks to be a Torah. Even if they were born Jewish (and in this “Rabbi’s” case I’m pretty sure he wasn’t) there is no member that can be even remotely considered a practicing Jew. It’s all for our benefit. To make us feel more comfortable while they fill our heads with their lies. They plant the seeds water them with friendship, love and cult-like teachings. I wonder what would happen if our Rabbis, Cantors and Jewish lay leaders spent as much effort teaching us to love Judaism (and yes, many do especially the Lubavitch) as these evangelicals do trying to teach us to love Jesus. My opinion; these messianic groups would wither and die. No Jew that understands the beauty of our religion has any need to seek another path to G-d. What do you think? Jews and The Rapture- Why they want so desperately to convert us. If you’ve been reading my blog you know that there is a huge Christian evangelical movement to convert Jews to Christianity. They call it Messianic Judaism and tell the lie that you can believe that Yehoshua (Jesus) is your messiah and still be a practicing Jew. I’m not going to go into why that is a lie in this blog. I’m going to try to answer the question of why they have a mandate to have Jews accept Jesus as their savior. The goal of messianic “Judaism” and similar groups is to blur the line between Judaism and Christianity, to make Christianity more palatable to Jews. Some evangelical Christian’s believe that for the return of Christ to occur, a certain amount of Jews must accept Jesus. The count varies but 144,000; 12,000 for each of the 12 tribes is a popular number. Most messianic “Jewish” congregations and organizations are intertwined with the evangelicals, who start and fund these congregations. Most of the members of messianic “Jewish” congregations are practicing evangelical Christians. If you have never heard of the Rapture you are about to. The concept was popularized in the 17th century by Increase Mather and his son Cotton Mather. They said that those who believed would be caught up in the air. When all these good Chistians were miraculously transported to (presumably) heaven, those left on earth would be judged and this would be followed by the millenium. Today there are variations on the theme but the basics remain the same. The big difference is the Jewish factor. When the UN voted to give the Jewish people their own nation in 1948, some evangelicals saw this as a sign of prophesy in the Christian bible coming to fruition. I don’t know how they interpreted the bible and there are many different interpretations but this is a compendium of what they believe. When 144,000 Jews have been converted to accept Jesus, the Rapture will occur sending all true Christians immediately to heaven and the arms of Jesus. (The first reason they need to convert us.) Left behind will be everyone else. During the next thousand years, the anti-Christ will walk the earth trying to turn people away from Jesus. At the same time, the 144,000 converted Jews will walk the earth trying to get people to accept Jesus. (Now you know the second reason they need to convert us.) At the end of a thousand years, the Second Coming will occur and Jesus will return to earth, ruling from Jerusalem. At that time all those who accepted Jesus will live on earth in peace; The rest of us-well sorry dear reader but we’re going to hell and burn in the fires of eternal damnation. Oh, and I thought the Christians were doing this out of their love for the Jews. Well the truth is out. Evangelical Christians want Israel for Jesus and his followers while they live it up somewhere up above. The fact that Jews, Muslims, Buddhists and all the other faiths that don’t accept their belief system will be burning below, doesn’t seem to bother them one bit. So please-don’t tell me that evangelical Christians are raising millions upon millions of dollars for Israel to help the Jews. Their motives are clear if you just open your eyes and mind to see them. Most of their money in Israel goes to form centers run by evangelical Christiansto help Jews accept Yehoshua (Jesus). The leaders in Israel are blinded by the money and look away from the truth of these people. They are not our friends, they are our nemesis. My husband tells me this piece of history from the Holocaust. Eichmann offered the Allies a trade; 500 Jews for one truck. He was turned down and the thousands that might have been saved, went to their deaths in the camps. My question is this: What is the price of a Jew today? What should we call them?